KISSIMMEE, FLA. – Aug. 24, 2017– East Coast Defender has breathed new life into another Defender 110 with its latest award-winning build, “Project Kingsman”. The luxury SUV, which was designed and built at the Rover Dome in Kissimmee, Florida, was completed earlier this month and has been rebuilt from the ground up and features a brand new, galvanized chassis. “Project Kingsman” showcases the classy and refined look of the Defender, yet has been rebuilt to be more powerful and agile than its original OEM build. It’s built on a new galvanized chassis, which will prevent the frame from rusting and increase the Defender’s longevity and durability. During the rebuild no nut or bolt was left untouched. It has also been upfitted with the latest technology and performance equipment. East Coast Defender was founded by three self-prescribed “British petrol heads,” brothers Tom and Elliot Humble, and Scott Wallace. Growing up in England, near the famous Lode Lane factory where the Defenders were produced, the three found themselves surrounded by Defenders throughout their childhood. East Coast Defender officially opened its facility in 2013 and has been building the world’s most celebrated, handcrafted Defenders since that time. Today, the company is based in Kissimmee, Florida, where every ECD custom Defender SUV is built by hand in the company’s 21,000 sq. ft. manufacturing facility, called the Rover Dome. Visit www.EastCoastDefender.com for more information and to learn how to own a handcrafted, custom engineered Defender. 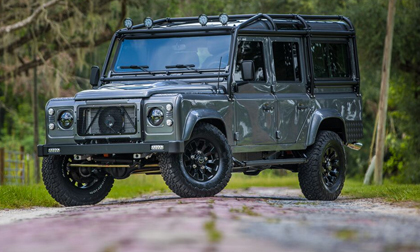 Located in Kissimmee, Florida, East Coast Defender is an award-winning builder of premium Land Rover Defenders. With over 25 years of Land Rover Defender building experience, ECD has earned a reputation for its commitment to perfection, its dedication to build quality and its ability to maintain the heritage of the Defender while modernizing it for clients. East Coast Defender has grown tremendously and has expanded the term “luxury vehicle” to “all-terrain multi-functional luxury vehicle.” East Coast Defender currently has over 30 full-time employees in its 21,000 square-foot facility. For more information, please visit EastCoastDefender.com or call (407) 483-4825.